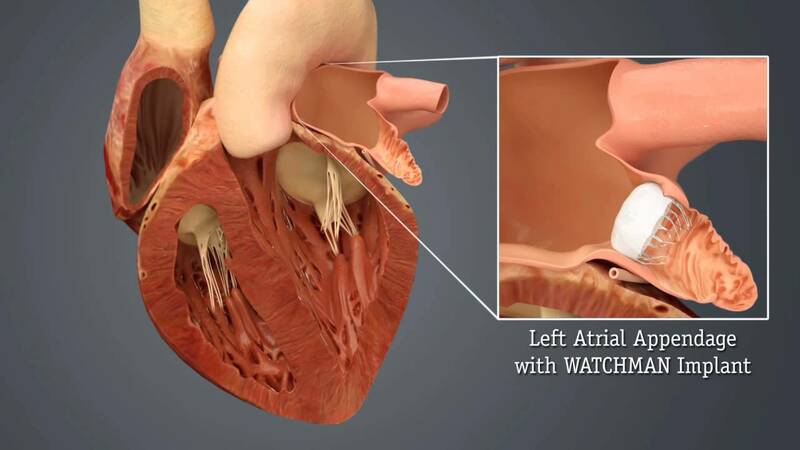 Atrial fibrillation is an atrial arrhythmia where the atria shows chaotic and disorganised electrical activity resulting in loss of normal atrial systole. It is associated with formation of thrombosis within the atrial appendage which can break off and embolise. The brain has a high flow rate for its volume and is a high risk target for embolism. Atrial fibrillation per sae is not a fixed risk. Risk requires the arrhythmia plus a set of confounding risk factors which dramatically increase the risk of cardioembolic stroke. Why not all AF is equal is an interesting topic yet to be explained. The risks are well set out in scoring systems such as CHADS2 and CHADS-VASC seen below. Generally anyone with TIA and Stroke and AF benefits from anticoagulation unless there are significant bleed risks. AF occurs due to structural and/or electrophysiological changes to atrial tissue that promote the characteristic abnormal impulse formation and/or propagation. The list of causes is broad from excessive T4 to chronic hypertension or infiltrative diseases or acute infection. There are a whole plethora of intrinsic and extrinsic factors for which the final common pathway is the generation of AF. Once AF begins it seems to be self sustaining and "AF begets AF". A lot of consideration is looking at whether AF is causative or associative with stroke. Those with AF have a 3-5 fold increased risk of stroke. A causal link is easily explained through the atrial stasis and thrombus formation pathway. For some the link is less clear and other factors come into play. AF however seems to be commoner with lacunar strokes. Those with AF also have twice as much large artery atherosclerosis. A good review article on AF and mechanisms is found here. Atrial fibrillation accounts for ≥15% of all strokes in the United States, 36% of strokes for individuals aged >80, and up to 20% of cryptogenic strokes. The incidence of AF in those over 85 is over 10%. The effects of AF are not just cardio-embolism but fatigue, worsening heart failure, palpitations and reduced mortality and morbidity much of which is allied to the underlying cause. Atrial fibrillation is extremely common in those over the age of 65. In terms of stroke risk patients should be divided into those with or without mitral valve disease mainly stenosis. These are the so called valvular AF with a very high risk of embolic phenomena and stroke. The risk of stroke is at least six times higher in patients with atrial fibrillation than in healthy controls. The loss of atrial systole in atrial fibrillation leads to stasis and thrombosis most marked within the left atrial appendage. Atrial fibrillation can come in several different forms as shown in the table below. Valvular heart disease tends to infer the presence of rheumatic mitral stenosis which is the most common lesion associated with thromboembolism, irrespective of the coexistence of mitral regurgitation. Atrial fibrillation develops as MS progresses and increases the risk of thromboembolism up to 18 times. Thrombi associated with mitral stenosis can be found on the atrial wall or in the left atrial appendage. Risks of embolic stroke in these patients is related to age and low cardiac output, but not left atrial size, mitral calcification, or severity of mitral stenosis. The association of mitral regurgitation with thromboembolism correlates with the coexistence of mitral stenosis. Oral anticoagulation reduces risk of stroke in patients with rheumatic mitral stenosis, particularly those with coexistent atrial fibrillation. The risk-benefit ratio in those without atrial fibrillation is not known. Of those patients who have had one event, early recurrent embolism has been reported in up to two thirds and aggressive anticoagulation instituted with Warfarin. The newer agents such as Dabigatran have not been licensed for use in this group of patients and either Warfarin or LMWH is needed long term. This is defined above as those with AF but no rheumatic mitral stenosis, no mechanical or bioprosthetic heart valve or mitral valve repair and this definition is used in the AHA/ACC guidelines listed below. For these patients the CHA2DS2-VASc score is recommended for assessment of stroke risk. So there are some patients with AF who are at a very low risk of cardioembolism. Where the stroke risk is less than 1% Warfarin is not advocated and aspirin is possibly a reasonable choice. In an attempt to improve risk assessment the CHADS2 score has been very helpful and has been improved upon with the CHADS2-vasc score [Lip GY et al. 2010, Olesen JB 2011]. The score is useful for assessing risk, giving a more personalised risk assessment to patients and communicating risk and beneficial strategies. However the risk of anticoagulation related bleeds must balance the reduction in embolic episodes. The HAS-BLED score has been shown to be useful. For patients with non-valvular AF and a CHA2DS2-VASc score of 0, it is reasonable to omit antithrombotic therapy. For patients with non-valvular AF with prior stroke, transient ischaemic attack (TIA), or a CHA2DS2-VASc score of 2 or greater, oral anticoagulants are recommended. However one has to balance this with bleeding risk which can be quantified to some extent by the HAS-BLED criteria shown below. Interestingly the risks of bleeding often are similar to those of risks of ischaemic cardioembolic stroke e.g. stroke, blood pressure and age. It is a delicate balance but most of us would favour anticoagulation and to manage any risks of bleeding as and when they happen. Expert and multidisciplinary decisions may be needed involving patients and those important to them in many instances. The risk of major haemorrhage attributable to anticoagulation therapy is typically between 0.5% and 1.0% per year. When the risks of ischaemic stroke exceed this then anticoagulation is recommended. The optimal intensity of anticoagulation appears to be an INR of 2.0 to 3.0. However we are now seeing new drugs that are likely to replace warfarin. The holy grail of AF anticoagulation management is to find a drug more effective, but less harmful than warfarin that is cheap too. Warfarin anticoagulation titrated to an INR of 2.0-3.0 is recommended for the average patient with a CHA2DS2-VASc score =2 unless contraindicated (e.g., history of frequent falls, clinically significant bleeding, inability to obtain regular INR). Either Warfarin or Aspirin can be used for the average patient with a CHA2DS2-VASc score of 1 depending on physician discretion and patient preference. Aspirin 75-325 mg daily or no treatment may be reasonable depending on patient preference for the average patient with a CHA2DS2-VASc score of 0. Those with AF should have an ECG, CXR, FBC, WCC and TFT as well as a cardiac echo. Various Cardiac structural defects can lead to the formation of intracardiac thrombi and cardioembolism. If suspected the first investigations include a clinical history and a search for any determinants that will give a clue. Cardiac symptoms suggestive of ischaemic heart disease, chest pain, breathlessness and palpitations which could suggest an ischaemic cardiomyopathy. A history of rheumatic fever could suggest valvular disease. A history of excess alcohol might suggest an alcoholic cardiomyopathy. Cardiomyopathy may also be seen with HIV. Examination may reveal heart failure, rashes, AF, signs of chronic liver disease, nicotine staining, hypertension and murmurs. An ECG,CXR and then Echo will be useful. A troponin may be useful acutely if recent myocardial infarction is suspected. Temperature and stigmata for endocarditis must always be considered. Acute care is not really for discussion here and can be found in the links below other than to say that those who are haemodynamically unstable should be considered for emergency DC cardioversion. In stable patients with recent-onset AF/ atrial flutter (AFL), a strategy of rate control or rhythm control could be selected. Those with AF or AFL of ≥ 48 hours or uncertain duration should be considered for anticoagulation. In the acute ischaemic stroke setting anticoagulation is generally delayed until 7-14 days post ischaemic stroke and an Anti-platelet is given in the meantime. In a TIA anticoagulation can usually be commenced in clinic the same or next day. Management of AF which is beyond the scope of this book. Management strategies of rhythm or rate control do not appear to significantly affect stroke risk. Cardioversion is associated with increased stroke risk so patients should be anticoagulated for at least 3-4 weeks prior unless the arrhythmia has only been present for less than 24 hours or TOE reliably shows no Left atrial appendage clot. All patients should be anticoagulated post cardioversion. Post op AF is seen in those post cardiac surgery and has a three fold risk of TIA/Stroke. For patients with non-valvular AF with prior stroke, transient ischaemic attack (TIA), or a CHA2DS2-VASc score of 2 or greater, oral anticoagulants are recommended. The use of direct oral anticoagulants has revolutionised the cardioembolic management of non valvular AF. They have for many replaced warfarin. There are now at least 4 new oral anticoagulants available. These are listed below. Those with valvular AF need anticoagulated with warfarin. Many of these newer drugs are renally excreted so creatinine clearance should be checked before usage. Renal function should be evaluated before initiation of direct thrombin or factor Xa inhibitors and should be re-evaluated when clinically indicated and at least annually. For patients with atrial flutter, antithrombotic therapy is recommended using the same risk profile as for AF. If the creatinine clearance < 15 ml/min then switch to Warfarin. Anticoagulation is the standard treatment of choice to reduce the risk and size of cardioembolic stroke. When anticoagulants are contraindicated due to excessive bleeding risk then Percutaneous Left atrial appendage oclusion may be considered. Patients selected should be those patients with AF with a high stroke risk and contraindications for Oral Anticoagulation. An excellent review can be found here. It is an evolving field and perhaps best if those undergoing the procedure do so as part of a RCT.